I have a partial result in terms of visit-statistics and have posted two plots here. The first plot depicts the number of visits made by each species on a particular day. 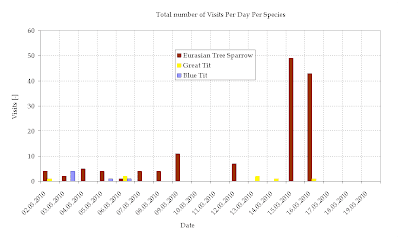 The second plot depicts the number of visits made one or more Eurasian Tree Sparrow(s) per hour each day (the images can be enlarged by clicking on them).